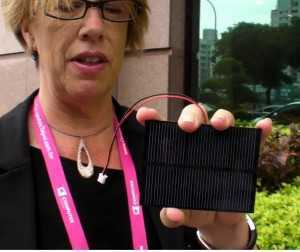 How close are we to powering our tablets with on-device solar cells? In a recent test I ran a tablet connected to the internet at an average 200 mW. That’s screen off, wifi connected and polling in the background to update emails, location, twitter and other processes. It’s nothing really surprising because most of the tablets are built on smartphone technology. With the screen on though, usage will jump about 5-7x and if you push the CPU and add 3G you can reach 20X that power drain. Still, running everything in 4W is still impressive. It’s just a shame that 20-30% of the in-use power and about 70% of the idle power when the screen is on is used by the screen itself. LED-backlit technology is getting better but only in small amounts. What if you could use ambient light for the screen, just as we do when we read a paper book? Pixel Qi is one company that are developing these ‘transflective’ screen technologies and in an interesting interview I saw today, Mary Lou Jepsen, the founder, talks about using solar energy to power a low power tablet with a Pixel Qi screen. By combining transflective screen technology with a low power tablet, you’re talking about 1W of power in idle, screen-on situations. Unfortunately, the 1W panel that Mary Lou shows, isn’t going to be enough. 1 – No one leaves their devices in the sun unless it is in a secure place. It is usually recommended that devices are not left in the sun at all. 2 – There are, on average during a summer period, about 4 ‘solar’ hours per day in central Europe, rising to about 7, year-long towards the equator. That’s because the sun is only at its strongest for the midday period and clouds and shadows will also impact the overall efficiency. 4 – Charging circuitry is innefficient. You can lose 20% of the engery through the charging electronics. Don’t forget that we tend to be awake and using our devices during sunlight hours and we tend to do that away from the sun so the possibilities for on-device charging are seriously limited. While a 1W panel sounds like it might be enough, to charge the average tablet (with a 15Wh battery) you’d need to sit the device in the midday sun every day for about a week for a complete charge. Yes, Pixel Qi screen technology reduces the battery requirements but even with a battery half the size, the time taken and the akwardness would make the process unusable for all but the most niche of cases and even in those cases (off-the-grid, emerging countries) a solar charging station for replaceable batteries is, in nearly all cases, a better idea. Of course there are some scenarios where this would work today and at some point in the future the cross-over point will be reached where it makes sense to build solar cells into consumer devices. Pixel Qi are definately doing their bit to accelerate this but there’s still a way to go before we see solar panels built into tablets. I am happy that you’re still pursuing this. I came back to your site recently as I was sourcing parts for my “off grid” office, and it seemed as though the site was nowhere to be found. Solar mobile computing is still a tall order. In fact, powered exclusively by the sun is nearly as dumb as powered exclusively by the power grid in my world. For me, it’s not about one being better than the other. It’s about avoiding circumstances in which a single point of failure stands between you and the ability to keep going. The greatest challenge that I faced in creating my “off grid” office was selecting the monitor. I’m not objectively satisfied, but my constraints are. Hopefully, more companies can join Mary’s to bring better solutions at lower prices to the end consumer. I’m not holding my breath though. Yesterday’s computing component company made profits by appealing to the knowledgeable, demanding customer. Today’s makes money by dumping the lowest quality junk on the largest pile of idiots. In fact, even people who used to be competent consumers just stopped caring, and people filled with nothing but delusion can easily pass themselves off as “an expert” to your average consumer. It’s not a great climate for people who need or want something of high quality. The prevailing assumptions in consumer technology are that electricity is cheap and plentiful and devices will be complete replaced in a year or two. I wouldn’t expect very much quality to come out in that kind of market, especially in so far as solar mobile computing is concerned. We are basically with computers where we were with automobiles right before the 1970s energy crisis. We were on the verge of a golden age of computing just a few years ago, and instead of stepping through the threshold by addressing the outstanding flaws, we let marketers pull us into their Fantasyland and then thanked them for the delusion. I imagine it’ll all flip upside down soon and people will complain about their self-inflicted injuries. Even though that’s not a happy prediction, it’s still better than the alternative: sticking your hand in the sand and pretending that it’s not. Still, there are a few great opportunities the exist in technology if you look hard enough and are smart enough to know the difference between “bad” and “good” (which most people aren’t, in my professional computing). My entire office basically runs beneath the 60W envelope no matter what I’m doing. I can do all of my desktop right around 10W. Granted, I’m not going to be decoding and watching HD video streams at that level of energy consumption, but I am making piles of cash (probably because I’m doing something better with my life than watching HD video streams). Would be interested in hearing more about the monitor you’re using and yes, avoiding that single point of failure is a valid reason to look at alternative energy sources. Sorry that the blog went away for a while. it went off-air when I migrated some services and I only recently noticed! Am interested in powering a table-top/counter-top kiosk featuring tablet, and small thermal printer. The table requires +5V 4000 mAH. Any chance I may use this technology. The unit is custom-made and runs vending applications. Looking at your Video, this is a perfect solution for African contexts.